For two weeks every summer, the Walter Cronkite School of Journalism and Mass Communication brings top-performing high school students to ASU for two weeks of intensive, hands-on experiences in broadcast and digital journalism. The 2019 institute will take place June 2-14, 2019. Students report and produce original stories and create an SJI website or news broadcast. 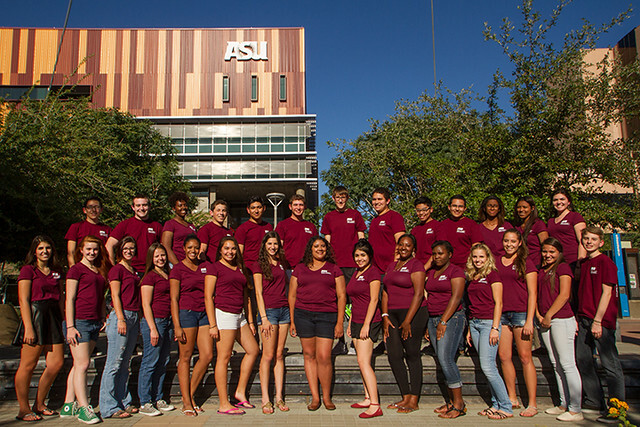 They are housed in an ASU Downtown Phoenix campus residence hall under the supervision of ASU students who serve as counselors. "Going through the Summer Journalism Institute opened my eyes to all the opportunities the Cronkite School offers their students. After SJI, I found my passion for weather and have decided to double major here at the university. Without going through the hands-on experience with SJI, I wouldn't be in the position I'm in today with the university." -- Katrina Arroyos of Tucson, Ariz.
"This experience changed my life. I left with 25 friends. I improved all of my writing skills, photo skills and Wordpress skills." -- Hayley Gorman of Tempe, Ariz.
SJI is made possible, in part, by support from the Arizona Broadcasters Association, RIESTER, the Dow Jones News Fund and a handful of generous alumni and friends of the school. Students are expected to provide their own transportation to and from ASU and cover the cost of incidentals. Selection into the program is competitive. Students must submit applications by the application deadline of March 8, 2019. For questions, email CronkiteSJI@asu.edu.